If you are planning your own trip or you are looking for support for your next expedition, contact us as we have fully equipped vehicles and experienced crew on hand to assist any expedition. Whether you wish to see the 'Big Five' or just the 'Big Cats', the great wildebeest migration or a bird watching safari, we will be delighted to assist you in planning a unique holiday designed just for you..
From the Masai Mara to the Indian Ocean Beaches, Kenya is the original home of the Safari. We offer you award winning national parks and beaches as well as unique activities & attractions. From the breathtaking Serengeti to exotic Zanzibar Island, Tanzania offers world class wildlife viewing, breathtaking islands, rich tribal culture & Africa's highest mountain, Mt Kilimanjaro. Two jewels in East Africa's crown, visit Uganda & Rwanda and meet a Mountain Gorilla, raft the world's longest river, the Nile and explore some of the friendliest places on the planet. Safari Joe arrange Kenyan, Tanzanian and Zanzibar beach holidays at enchanting hideaways along the breathtaking coastline of the Indian Ocean. Accommodation, tours, travel & activities available. Let us design a unique wedding or honeymoon for you; enjoy the luxury of your own vehicle, dine under a million stars and be pampered on the romantic Indian Ocean beaches. Imagine seeing Africa through the eyes of a child! Camping under star-filled skies, storytelling around the campfire, explore some of Africa's finest national parks, magical for all the family. Team Building Events are a great way to have some fun and also encourage people to communicate, solve problems and work together. Venues can be arranged in bush or beach locations. Our courses are aimed at professionals in the Travel and Tourism Industry. Let us share with you our vast knowledge and years of experience with our unique training courses. Tailor made itineraries. Volunteering or assisting with community projects in Africa is a great way to learn more about a country and get involved. Incorporate this as part of your safari, there is always a job for you! Your East African Safari Specialist Let us show you the stunning scenery, diverse cultures and rich wildlife that make Kenya, Uganda & Tanzania the perfect safari locations, a safari you will treasure forever, a journey you have only ever dreamed of. 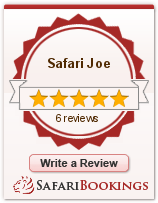 Travel with Safari Joe and your African Safari will be an amazing and unforgettable travel experience! We know Africa intimately, it runs through our veins and beats in our hearts, let us share with you the culture, wildlife and magic that this exotic destination has to offer. Whether its wildlife, beach, cultural, sports or adventure holidays, Safari Joe will tailor make a trip to suit your interests and budget. We cater for all ages, individuals, couples, families, groups and clubs.